"CoCo" is an affectionate abbreviation for "Color Computer," and refers to the popular TRS-80 Color Computer, manufactured by Tandy and sold by Radio Shack from the early to late 1980's in various forms and models. The CoCo was spawned at a time when an affordable home computer was a new concept. It was also a time when many competitors introducing their own home computers, including Commodore, Apple and Atari. Unlike most other systems of that era, however, the CoCo has stood the test of time -- over two decades since its introduction, it still has a small but loyal base of users and supporters buying newly developed hardware and software. The first Color Computer, introduced in 1980, was the infamous "battleship grey" TRS-80 Color Computer. It would later come to be known as the CoCo 1. Sporting the then-advanced Motorola 6809 microrprocessor, 4K of RAM and a very simple BASIC interpreter, the CoCo 1 was soon expanded to 16K, 32K and even 64K by intrepid hackers. In 1983, Tandy introduced the TRS-80 Color Computer 2 to its Radio Shack stores. The CoCo 2, as it was known by loyal users, was an improved version of the CoCo 1, having a more appealing white case and better keyboard, while still maintaining software and hardware compatibility with its grey predecessor. 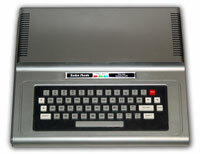 Later models of the CoCo 2 carried the Tandy name instead of the "TRS-80" label. The last of the Color Computer line was introduced by Tandy in July of 1986. Known as the Tandy Color Computer 3 (by this time, the TRS-80 name was dropped in favor of using Tandy), the new version of the popular CoCo line came with 128K of RAM, more colors, enhanced graphics, an updated BASIC interpreter, and had minor color changes made to its exterior. It also ran Microware's advanced OS-9 Level Two Operating System. In 1989, Tandy officially dropped the CoCo 3 from its computer line, relegating it to the growing list of "out of production" home computers. However, in the 1990's, the CoCo still enjoyed amazing success, with annual "fests" being held in cities such as Chicago and Pittsburgh, giving users a place to meet to swap stories and buy products.